I like to send my friends valentines every year (friend love is love! ), but I almost missed doing it this year because Valentine’s Day falls right in the middle of Olympics season! I’m a fan of sports, and I especially love to watch the Olympics for women’s sports excellence. Today’s featured picture book doesn’t feature sports, but it does have spring holidays, friends, and overcoming fears with help from those friends. 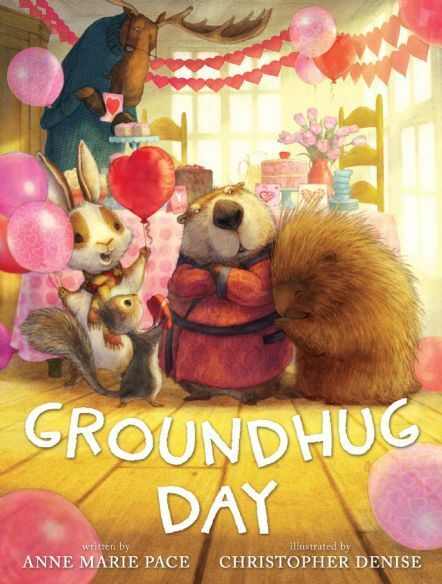 Let’s talk about the adorable Groundhug Day by Anne Marie Pace, illustrated by Christopher Denise. Moose is having a Valentine’s Day party, and all his friends are so excited! Everyone except Groundhog, that is. If Groundhog sees his shadow outside, he’ll hide in his hole for six more weeks and miss the party! Determined to help their friend join them, Moose, Squirrel, Bunny, and Porcupine put their heads together and come up with a plan. But will it be enough to get Groundhog out to play? This heartwarming picture book by the author of Vampirina Ballerina, with adorable illustrations by Christopher Denise, is sure to be a hit, whether readers are bursting for spring or snuggling up for six more weeks of winter. Moose, Squirrel, Bunny, Porcupine, and Groundhog are all fast friends, and Moose is planning a Valentine’s Day party. Moose wants all his friends to come. Squirrel wants to have Valentine balloons. Bunny wants Valentine cards. Porcupine offers Valentine hugs (ouch!). But while the animals are planning, their friend Groundhog comes out of his hole on Groundhog Day and sees his shadow! How will they get him to join the party? Following some helpful demonstrations, Groundhog overcomes his fears, hugs are offered all around, and he reappears six weeks later in time for a St. Patrick’s Day party. Groundhug Day is a celebration of friendship featuring incredibly cute animals against the backdrop of spring holidays. It’s the sort of picture book that will be a big hit with parents, teachers, and librarians as well as kids – there’s subtle humor, a good message, and it’s seasonally appropriate for several months of the year. Will it appeal to ALL kids? I can see how the cover could prompt some adults to hand it to girls especially, but it’s a picture book about animals for small children – it’s meant to be read aloud, and it’s appropriate for everyone. As for the animals, a couple use male pronouns, and another is coded as male (Moose wears a cozy sweater and reading glasses), so there’s inclusion baked in. Let’s talk about the art! Christopher Denise has nailed cute and cozy in this book, and it’s charming. Also, fun. Bunny and Squirrel are especially delightful with their big, liquid eyes and general fluff. But the book is not just animals – the pages are populated with home interiors meticulously decorated and filled, and landscapes depicting mountains, meadows, and trees. No detail is left untended (including the endpapers! ), so the overall feel of the book is lived-in, and loving. It’s a treat. In all, Groundhug Day is an appealing, enjoyable picture book with potential staying power due to its themes and exceptional art. Recommended for: kids ages 4-8 and their adult readers (if the kids are on the younger side), and anyone looking for a spring holiday-themed read. Fine print: I received a copy of this title from the publisher for review consideration. I did not receive any compensation for this post. Most years, I try to see a majority of Oscar-nominated films. Why? Because 1) I like going to the theater, 2) I took a course on film history in college and it ignited a lifelong interest in the medium, and 3) sometimes they break and mend my heart the way that a good book does. So, here are some thoughts from the night I saw Lady Bird, and some from a week later. 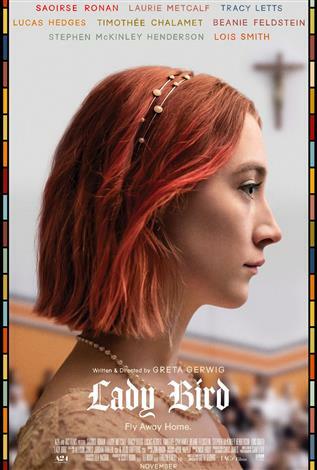 I just saw Greta Gerwig’s Academy Award-nominated film Lady Bird, and the whole way home my senses were heightened, my feelings were feeling, if you will, and I couldn’t quite decide how to address it all. I texted the wise friend from grad school who urged me to see the film a couple of months ago. But still, words were brimming up and spilling up outside of thought and oh yeah, I totally talked to myself on the bus. Oops. Well, I have this beautiful blog that has been sitting, unloved and un-updated for months! The perfect place to park for a bit, unburden, and unwind. I hope you’ll indulge me. Gerwig captured so beautifully many of the contradictions of being a teenager – especially an American teenager in a world post-9/11 and on the cusp of embracing the internet with open arms. I cringed and laughed and nodded along at so many moments. The music was just right. The being a lower middle class kid at a private school atmosphere was just right. The thrift shopping! Any time Lady Bird fought or interacted with her mother. The best films and books (stories in general, really) take you out of yourself, and make you look at and experience the world in a deeper way. I may have squirmed and cringed and laughed and wished myself away from the theater during awkward moments in the Lady Bird screening, but I came out ready to *experience* everything. I watched the world around me with unnerving intensity for a couple of days, trying to drink it in and capture some of the magic that Gerwig infused her film with. I felt in the moment, and I kept on feeling, and I kept thinking of new ways to engage, to be a better person. In that way, the film was incredibly inspiring. And yet, after sitting with the film for a week, and telling people about it, and how I felt about it, I would no longer call it only “inspiring.” My favorite descriptor now is “authentic.” I told various friends that it felt like a thinly veiled biography of my own teen experience – down to the stubborn, know-it-all, lying-to-your-“friends”-to-make-them-like-you-and-hide-your-ignorance truth of those years. It reminded me of the vague hopes and dreams of teenaged Cecelia. What did I want in 2002? I wanted to be independent, to get away from family and Seattle, to have true privacy (I used to drive to the public library some weeknights in high school just to have space to think), and to have friends who got me. Sixteen years later, and I have different (more specific!) goals and dreams. I often feel as though I’m not meeting them, and that I am letting people down. Taking a moment like the one provided by Lady Bird, though, I realize that I have done it. I’ve met those 2002 goals and dreams. Eighteen year old me would be so proud. And while present-me knows I can’t take that as any measure of success, that I have plenty of growing and learning to do, it was a happy, reassuring thought. So, here we are. I plan to keep asking how I can be a better version of myself, and to continue working on the answer. God bless Gerwig and the whole crew behind Lady Bird. They created art, and it was authentic, inspiring, and good. If you haven’t seen it yet, GO! the prince and the dressmaker blog tour - my favorite panel! 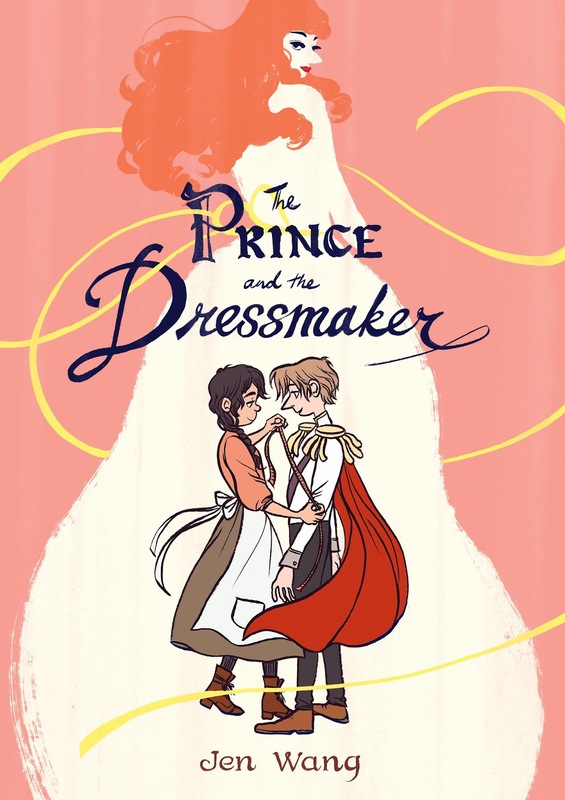 Today’s post is part of the blog tour for Jen Wang’s new graphic novel, The Prince and the Dressmaker. Wang plays with prince/princess stereotypes, identity, and fashion in this gorgeous standalone. Read on for a sneak preview of my favorite panel from the book and a brief review! The thing is, the thing is... if you tell me about a beautifully-illustrated young adult graphic novel with the formula "The [insert royal title] and the [insert profession]" for a title, I am sold right out of the gate. There's a part of me that will always love the promise of a fairy tale romance, and somehow that title tells me that it IS a fairy tale romance. For the record, I was not wrong! Oh dear, this is the cutest story! First, love the storyline, the coming to terms with identity and finding people who you can trust and who will hold your secrets and best interests at heart, all while trying to satisfy familial duty and professional ambition. Of course there's tension, accompanied by big reveals, angst, and some running away... but in the end this is a love story and it has a happy ending. Wang also tucked in hilarious lines here and there so I was always wondering what character was going to make me laugh out loud next. On top of the story, Wang is goshdarn talented, and this book is so *pretty* it kind of hurts? Like I want almost every page in poster form, on my wall. And I want all of the dresses, too! The fashion, the architecture, the colors and the vision! It's a feast for the eyes, and one that will draw in readers who might not typically pick up a graphic novel. Truly, it is beautiful, and it is art. A brief note on Sebastian's identity: the assumption of this reader (from the context of the story) is that Sebastian is gender nonconforming. And now, I'd like to introduce you to my favorite page spread (I liked the whole thing too much to pick just a panel!). Yes, there were more colorful panels, pages that showed bigger realizations and prettier dresses. BUT. This is the first time Sebastian and Frances have a moment of relationship tension, where it changes tangibly from friendship to... romantic potential?! The eye contact! The hand holding! Proximity alarms going off all over the place!!! (that's a good thing) And all over a "good night." I think you get the idea from the images alone, without even needing dialogue, and that speaks to Wang's storytelling. Just, SWOON. In all, The Prince and the Dressmaker is a delightful, subtly funny, and beautiful story that highlights themes of coming-of-age, acceptance, friendship, and following your dreams. I adored it. Recommended for: anyone who enjoys animated princess film classics, fans of young adult historical fiction, and readers ready for fairy tales and art updated for the modern world. Jen Wang is a cartoonist and illustrator currently living in Los Angeles. Her works have appeared in the Adventure Time comics and LA Magazine. She recently illustrated Tom Angleberger's Fake Mustache. Her graphic novels Koko Be Good and In Real Life (with author Cory Doctorow) were published by First Second. Interested in checking out other bloggers’ favorite panels from The Prince and the Dressmaker? Check out the tour schedule, or click any of the links below! The Prince and the Dressmaker will publish from First Second on February 13, 2018. Fine print: I received copy of this title for review consideration. I did not receive any compensation for this post.